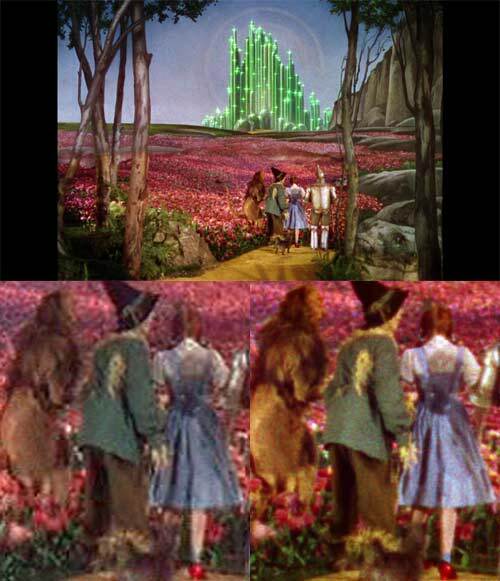 More Technicolor from the very earliest days, but it doesn't start until about twenty minutes into movie, with the Kansas introduction and the conclusion both in sepia tones. The picture quality is extraordinary. Beautiful, in fact. The only criticisms I could possible make is that there is occasionally a tiny bit of frame jitter, in which the framing jiggles around slightly (just a pixel or two), and particularly in the sepia parts there is occasionally a little brightness variation. 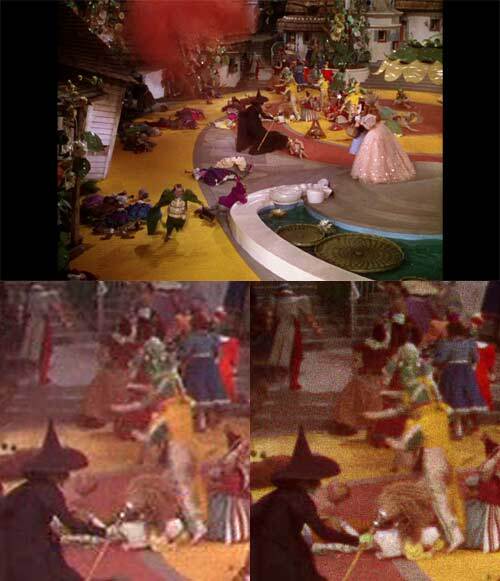 But the sepia parts are actually shot rather differently, more artistically in fact, than the colour central section of the film. The 3 strip Technicolor camera was so bulky that inventive camera placement and fluid movement was very difficult to achieve, especially as the film had an ASA rating of just 10, requiring enormously hot lighting to deliver any kind of respectable depth of field and shutter speed. As far as the sound went, the voices were clean and there was no noticable hiss, dropouts or optical scratches but the music consistently had that pinched 'old movie' sound. I figured that once again we had the 'Academy Curve', so I recorded the brief orchestral overture which plays during the opening titles. Looking at the resulting frequency balance graph, it was as though a hard bandpass filter had been applied, with the end points set at 50 and 6,000 hertz. Basically there was no usable audio content above 7kHz. The main audio is presented in Dolby True 5.1. Warner Bros seems to have managed to apply a little spread so that the sound doesn't seem to come from just one point, and fed a tiny bit of reverb into the back channels. This has been done tastefully so it is not at all intrusive. But if you prefer you can listen to the original mono audio (cleaned of hiss and crackles). This isn't provided in the audio menu, but as a special extra, and comes in the form of a Dolby Digital 1.0 audio track at 192kbps. This has a very similar frequency spectrum, except that the bottom end hits a brick wall at 70 hertz. There is a Singalong feature with progressively highlighted song lyrics over the movie. This is implemented as a BonusView PIP item, and it won't work with early Blu-ray players. With this edition you get a booklet, 'collectibles' and a second disc with lots of SD extras. 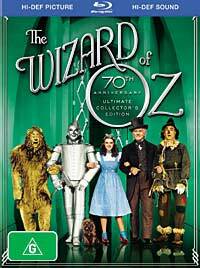 The best of these are six previous cinema versions of the Wizard's story, filmed between 1910 and 1933, one from 1914 directed by L. Frank Baum himself! 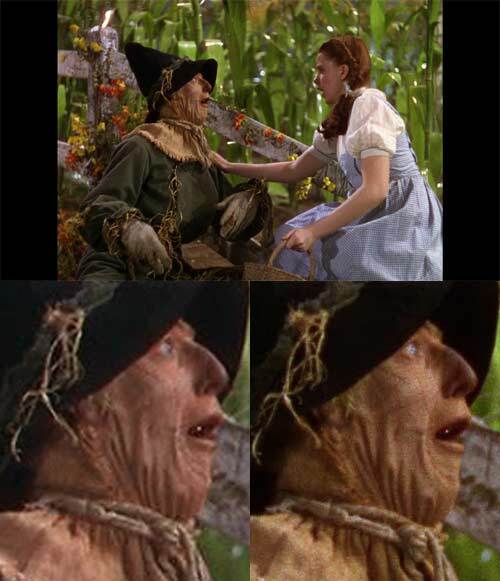 The worst would be the 1990 TV movie biopic about Baum, with quality that looks like a transfer from VHS. Here are some comparisons between the Australian PAL DVD and the Blu-ray versions of this movie. Both the DVD and the Blu-ray versions were supplied to me by Warner Bros, the former way back in 2000. Presumably a later DVD edition has been released including the most recent restoration work, but we'll stick with this version. In the following examples, at the top of each is the full frame (suitably shrunk down) used in the comparison, with a 250 pixel wide detail from the frame underneath. 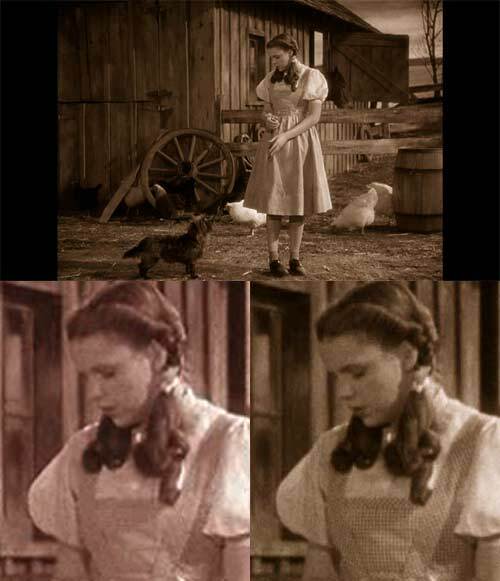 The left side is from the PAL DVD. 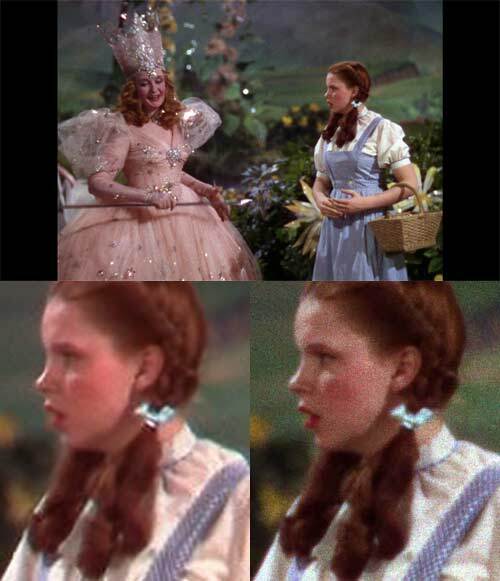 The image was captured digitally from the disc (using VideoReDo Plus), scaled up from its native 720 by 576 resolution to 768 by 576 (to present in the 4:3 aspect ratio) by the application. Then, in order to be comparable to the Blu-ray version, I scaled it from that to 1,440 by 1,080 in Photoshop. The detail is from that last scaled version, and has not been rescaled again. 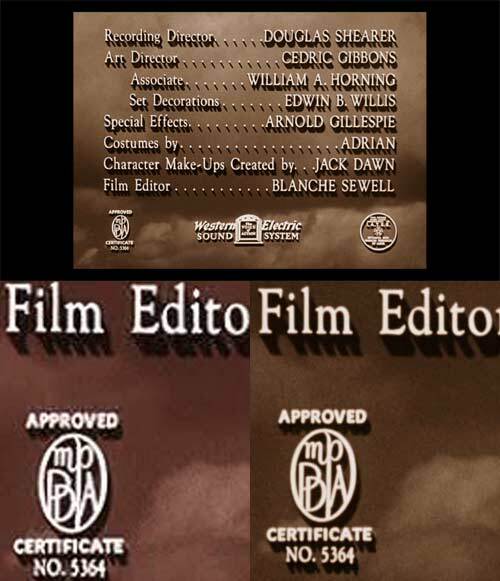 The right side is from the Australian Blu-ray (captured using the command-line media player MPplayer). This has not been scaled at all. Since different applications were used to capture the two frames, I am not normally comfortable comparing the brightness or colour between the two. For those visitors from NTSC lands, generally PAL DVDs are just a touch sharper than NTSC DVDs.